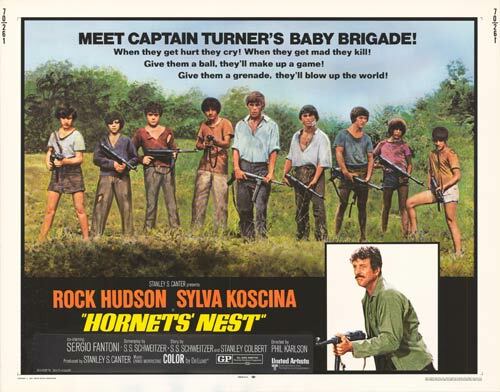 HORNETS NEST saw Rock Hudson finally give up on the big screen and turn to TV (to good effect with McMillan & Wife) on the heels of this miserable 1970 failure. This inept, inane, mean WW2 saga was the tail end of six years of Hudson movies that failed critically, commercially or both, and the justifiably poor response to this badly misjudged effort—one of director Phil Karlson’s worst (and that takes in a lot of celluloid)—was the nail that drove the discouraged Hudson onto NBC and into the arms of Susan St. James (at least in make-believe terms). Rock’s co-stars, Croatian sexpot Sylva Koscina (why did I give away my old Playboys?) and the likable Sergio Fantoni (here playing an icky German with a bad blond dye job) were also about out of steam, career-wise, so this behind-enemy-lines mission was cursed all around. Koscina got the role because Sophia Loren wisely dropped out. Italian location filming doesn’t help the story of a lone saboteur (Rock, sporting his Nixon-era mustache and the glummest character disposition in the Mediterranean Theater) leading a band of teenage boys (beginning to sound a little dicey…) on a mission (a desperate one, naturally) to blow up a dam. The kids look and act. They look like kids from 1970, and they act–badly. This hornets nest needs to be sprayed. 110 minutes landed with a thud on spot #93 for the year.